WEST POINT, Georgia, August 26, 2011 (ENS) – Two elite fuel economy drivers will attempt to steer a 2011 Kia Optima Hybrid into the pages of the Guinness Book of World Records this week. Hypermiler Wayne Gerdes and his colleague and friend Chris Bernius aim to set a new record for lowest fuel consumption in a gasoline hybrid car while driving through all 48 adjoining states of America. In a factory-standard hybrid four-door sedan from the Korean automaker, the drivers will depart from Kia’s manufacturing plant in West Point, Georgia today on the 8,000 mile fuel economy driving challenge. They plan to travel through the 48 states in a clockwise direction, before finishing in South Carolina on September 10. “Fuel economy is becoming increasingly important to car buyers all around the world, and the Kia Optima Hybrid is one of our latest models to address this consumer requirement,” said Thomas Oh, senior executive vice president and COO of Kia Motors. 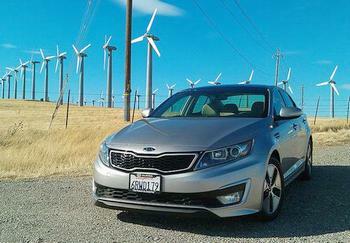 The Optima Hybrid is Kia’s first hybrid vehicle in the U.S. market and went on sale on East and West coasts in June, with national availability scheduled by the end of 2011. A European version – which mates the electric motor to a smaller, 2.0-liter gasoline engine – is expected to go on sale in some markets in 2012. The 2.4-liter Optima Hybrid employs a parallel gasoline-electric hybrid powertrain developed by Kia that delivers acceleration to 100 kph (62 mph) in 9.2 seconds, a top speed of 195 kph (121 mph). Kia says the car’s fuel economy is a 40.7 percent fuel consumption improvement over the standard Optima EX model in the United States. Gerdes has made a career out of hypermiling – finding ways of increasing a car’s gas mileage by making skillful changes in the way he drives. Driving the Kia Optima Hybrid around the country, Gerdes and Bernius will post live updates via Kia’s Twitter feed (@Kia_Motors) and a specially-developed Facebook app on Kia’s Worldwide page: http://www.facebook.com/Kiamotorsworldwide to help visitors track their journey. Photos, videos and a written blog will be uploaded to the page daily. The Facebook app will enable visitors to explore the drivers’ route in detail, and find out more about the Kia Optima Hybrid.